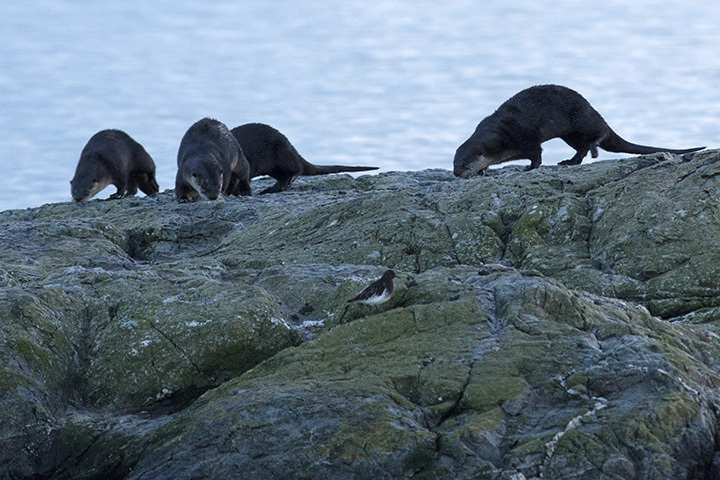 Early this morning, my brother and I watched a group of four river otters at Cattle Point in Victoria. The light was not strong enough for great photos, but it was OK for video. Check it out in HD for some otter nuzzling and defecation! What a treat for you! I think humans tend yo feel a greater affinity for animals who display traits we find commendable such as play and sociability like otters are. I know I’m especially fond of animals that are highly intelligent too. Otters fit the bill perfectly! Sean, these are river otters – do they go into the ocean at all, even a short way? It looks like that’s the ocean behind them and one otter is eating some flesh from what I can see. A fish it caught in the ocean water? Oh yeah, otters are common here on the coast. They are quite at home in the sea, so long as they have access to some fresh water to drink. That is seldom a problem here on our rainy coast! There are quite a few mink in the ocean as well, but they are a bit more shy.